eir has this morning announced that Setanta sports will now be known as eir Sport. The move comes after eir confirmed its purchase of the popular sports channel in April. All eir Sport channels, along with BT Sports, will be free for eir’s 370,000 broadband customers. Customers will be able to access the channels via a new eir Sport app or their eir Vision box. eir broadband customers, who also have Sky TV, will be able to access the channels via their Sky TV box. 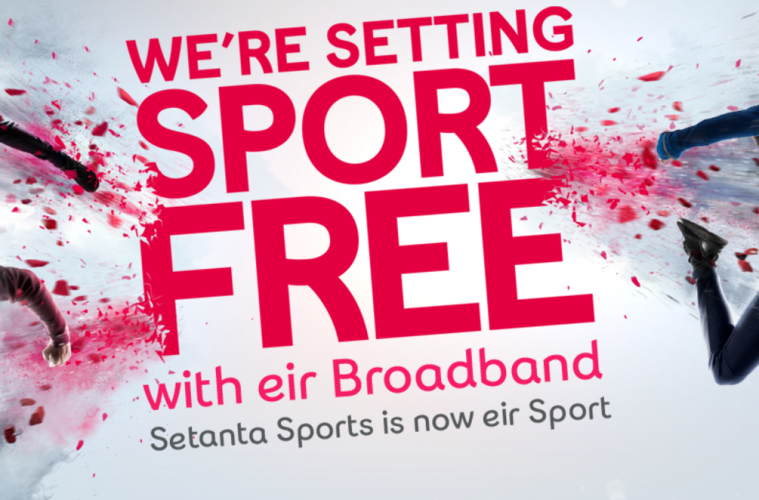 Any eir broadband customers who currently pay for a sports pack will no longer be charged for eir Sport or BT Sports. This content will also be available at no extra cost for those currently on a multi-room package. Commenting on the news, Eoin Clarke, Managing Director of independent price comparison website Switcher.ie, says: “Today’s news gives football fans a huge choice to make about which provider will give them the best coverage of their favourite team as we come into the new season. “The fact that eir is offering all of its sports channels, as well as BT Sports, free to their broadband customers is a massive draw, and will no doubt win over some fans. Competition in the broadband and TV market is hotting up, and this move by eir has really thrown down the gauntlet to other providers. We could see some counter offers across the market, which would be really good news for consumers.